How to Improve Your Work Productivity and Get Things Done! Would you like to know how to get more done when you work remotely, work in a cubicle, or work at home for your own business? Are you letting distractions rule your day? Are you finding it impossible to focus on important projects? Work Smarter Not Harder is your personal guide for helping you on your journey to increased productivity and better work habits. 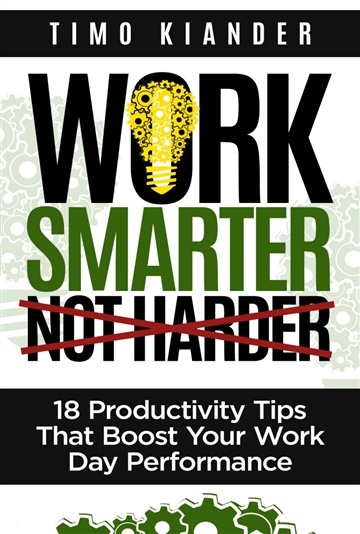 DOWNLOAD the book and learn 18 actionable ways to get more done, the smart way. Timo Kiander is an author, speaker and the person behind the blog, Smart Productive Work, helping busy work-at-home/remote working professionals to save time, improve their productivity and work/life balance. While he is passionate about the work he does, there are also other important components that make his life complete: spending time with his wife and his son and living the healthy lifestyle with exercising (running, biking, cycling) and nutritious food.